Stan Wawrinka claimed his third successive Chennai Open title with a straightforward 6-3 7-5 final win over 19-year-old Borna Coric. The world number four dropped only four points on his first serve as he wrapped up the title in 86 minutes. Croatia's Coric, who beat Britain's Aljaz Bedene in the last four, was the youngest ATP tour finalist since 2008. 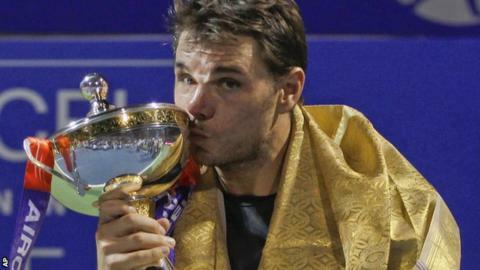 As well as final victories in 2014 and 2015, Wawrinka also won in Chennai in 2011 and was runner-up in 2010. "I was expecting a pretty tough match. He is really good and he always finds a way to fight and come back in the match," said French Open champion Wawrinka, who hit 15 aces. "It's a very important tournament for me, that's why I like to come back here. Perfect conditions to start. I am not thinking about the rest of the year now." Ranked 44th in the world, Coric is the youngest player in the top 50 and he admitted that his lack of experience told. "It's my first final so I'm going to make some mistakes. So give me some time please," he said. The Australian Open, where Wawrinka clinched his first Grand Slam title in 2014, begins on 18 January.